Movies are emotions that have been simulated from life experiences to communicate ideas, stories, perceptions and feelings that will also evoke the emotions into the minds of the audience. Over a time span of more than a century, from the era of silent films to the present era of digital film making, Bollywood is one of the largest film industries in the world, known for the production of commercial movies with high box office collections. At Dfine art we create movies to give people the simple pleasure of being transported to a different world by a story told on a screen. 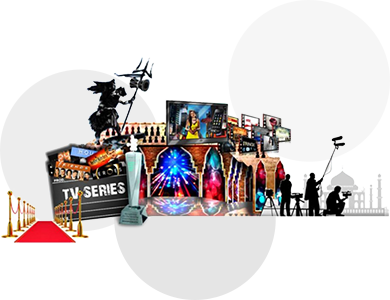 Our unique strategy in the field of art and production designing has paved the way for a tremendous growth of the firm connecting with the film fraternity and also in establishing our new production house. Spearheading D’fine art, Mr. Narendra Rahurikar, an ace production designer and art director in the Bollywood has laid a strong foundation by implementing innovative strategies. The persistent consistency and the success of D’fine art has been built on a foundation of stable management throughout its history and a long term professional relationship with many of the leading artists and technicians of the industry. Boosted with an efficient team of professional employees in all the departments from pre-production till the post production of any project, D’fine art is capable of planning and executing media contents through our unsettling dedication towards innovation and creativity.